Company Eknis carries out a set of activities and operations on Automated Meter Reading Systems (AMR Systems) and Local Data Acquisition and Processing Equipment (LDAPE). • warranty and subsequent technical maintenance. Our company provides a complex solution on metering of all types of energy sources EMCOS CORPORATE by Sigma Telas (Lithuania) for large consumers of energy sources (industrial enterprises of all fields, power generating and power supply companies, municipal enterprises). Due to powerful analytical module the complex provides not only data collection, processing and display, but also analyses collected data in order to forecast further situation development and warn personnel if needed. Such actions allow personnel to find out about energy sources’ consumption mode disruption to take appropriate measures. This as a consequence leads to more rational energy sources consumption, which is the main principle of energy efficiency. The following complex enables work with dispatching systems, energy sources monitoring systems and SCADA, as well as asset management systems. 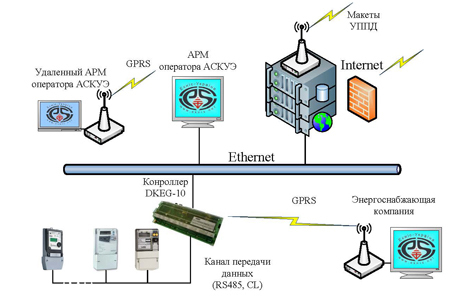 Thus, the complex by Eknis is more than Automated Meter Reading System, it is Smart Metering Solution. For local use at enterprises and for common use Eknis provides program set Electro. Complex Electro enables building different systems of commercial, technical metering and dispatcher control for power consuming objects, power generating and power supply companies. Complex can be used both separately and as a part of other systems.